The Two Faces Of January (12A) is one of those films that managed to skulk by without receiving even half of the fuss and acclaim that it deserved. A throwback to the crime-thrillers of the good ol’ days, The Two Faces Of January is sleek, sharp and oozing with charisma, talent, and above all – a great story. Set in the 60s among the beautiful backdrops of Athens, Crete and Istanbul, The Two Faces of January tells the story of Rydal (Oscar Isaac), an American con artist working in Greece as a tour guide, where he meets glamorous American couple Chester and Collette MacFarland (Viggo Mortensen and Kirsten Dunst). After finding himself in the wrong place at the wrong time, Rydal ends up entangled in the couple’s lives and it soon becomes apparent that he is not the only con artist around. Just in case you need even more convincing, here are five reasons why this film is definitely one to watch. As well as having a seriously talented on-screen cast to make The Two Faces Of January a viewing delight, there is some impeccable talent behind-the-scenes. Firstly, the book on which the film is based is written by Patricia Highsmith, the brilliant author behind The Talented Mr. Ripley. The similarities between the two film adaptations are striking, with a similar glossy exterior covering up yet more sinister undertones in The Two Faces Of January. Then, the film has the same producers behind it as another great thriller Tinker Tailor Soldier Spy. 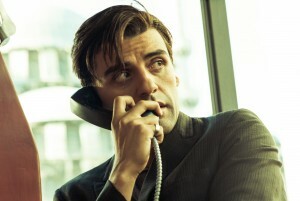 Finally, although The Two Faces Of January may be Hossein Amini’s directorial debut, he also wrote the screenplay – adapting the book for the big screen. Which is kind of a big deal considering he is also the writer behind critically-acclaimed Ryan Gosling crime-drama, Drive. See – we told you there were a lot of great people behind it! The crew might be strong, and the cast are second to none, but the real star of the show is Oscar Isaac. Isaac takes on the leading role as Rydal and he commands the screen with charm and charisma. His show-stopping performance adds to the film noir style throughout with a presence uncannily similar to that of the leading men from the old Hollywood classics of yesteryear. By the end of this film Isaac has cemented himself as one of the best up-and-coming actors to watch as he announces himself as a bold new face of cinema. As mentioned, the film is set in Athens, Crete and Istanbul and all of it was filmed on location, which means that we are treated to some beautiful backdrops and surrounding scenery as we get wrapped up in our three characters’ lives. A far cry from the last prominent film to be set primarily in Greece, Mamma Mia, The Two Faces Of January gives you an actual mini-tour of the Greek islands as it embraces Greek culture and landmarks, including the famous Parthenon. It’s not just the scenery that makes this film easy on the eye, the 60s fashion also shines through and gives it an old-school edge that other modern-day films lack. The costuming subtly adds to the traditional film noir tone, which the crime drama holds throughout, and the nostalgic imagery perfectly compliments the timeless performances. All of this just makes The Two Faces Of January appear fresh and innovative, despite being set over 50 years go. Yes it looks great and the cast and crew are great, but a film would be absolutely nothing if it didn’t have a good story. Thankfully The Two Faces Of January is certainly not lacking in this regard with a fascinating concept from the start. While watching, you’re never quite sure who you can trust as both men seem incredibly shifty and are equally wary of each other, creating an underlying tension throughout the entire film. Flawlessly paced by Hossein Amini, the film is unpredictable from start to finish and not even a second too long or too short as it concludes with an ending that is both surprising AND satisfactory – a rare combination in modern cinema. The Two Faces Of January is available on DVD and Blu-Ray from 15 September 2014. Check out our full 4-star review here and a Q&A with the cast and director of The Two Faces Of January.